Blink-182 is an American rock band consisting of vocalist and bass guitarist Mark Hoppus, vocalist and guitarist Tom DeLonge, and drummer Travis Barker. They have sold over 28 million albums worldwide since forming in Poway, California in 1992. With original drummer Scott Raynor they released their debut album Cheshire Cat in 1994 and achieved moderate success with its follow-up, 1997's Dude Ranch, which went on to sell over one million copies. Raynor was replaced by Barker midway through a 1998 tour. DeLonge left Blink-182 in early 2005, sending the band into indefinite hiatus. He went on to form Angels & Airwaves while Hoppus and Barker formed +44. 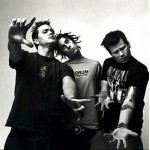 Hoppus also pursued a career as a television host while Barker continued working in music as a producer and solo artist. Blink-182 reunited in February 2009 and their sixth studio album, Neighborhoods, was released in September 2011.